After a ride in the passenger seat, we can sum up our impression of the Cadillac CTS-V Sport Wagon in one word: Perfect. Other words: Power, style, luxury, and five swingin' doors. The 'merican superwagon has it all. We had the chance today to get some passenger seat time with Cadillac PR chieftain Nick Twork in the CTS-V Sport Wagon, and as you might imagine, it was a rollickin' good time. What's truly remarkable about the V-Line, despite the disparate body styles, is how similarly the cars perform when you're strapped into the passenger seat. You'd think the feel of a sedan versus a coupe versus a wagon would be worlds apart, but they aren't. The common underpinnings and careful engineering mean they all share the same balance of stone-crushing power against predictable control. The V-Sedan and V-Coupe share pretty much everything under the skin, but the wagon required some more tuning. All that junk in the trunk allowing for a total of 58 cubic feet of storage adds up to a bit more mass to deal with. To deal with this, the Magnetic Ride system's been tuned differently and the rear anti-roll bar's a slightly smaller diameter. The result is a car you'd never know was a wagon. It's tight in corners, light over the road but has a firm, planted, Germanic feel to the suspension. For as well as the V-Wagon handles, it's still all about that bone-crunching acceleration. We could do pulls in these cars all day long and never want for more. The exhaust note is sweet, sweet supercharger music. It's unofficially two-tenths of a second slower at 4.1 seconds for a 0-to-60 MPH run, but your bicycle and fichus won't notice. What will get noticed is the simultaneously right and oh so powerfully wrong aggressive look. Peek at it from a weird angle and it looks like any other nondescript wagon, but stare it in the face and you know it means business. We said when we reviewed the CTS Sport Wagon, that the CTS looks better as a wagon, as if it came first and the sedan was carved out. In V-form it's even more true. This beast-with-a-back's a stunner and it's the first time I've ever seen someone whip out a camera phone to take a picture of a wagon. Inside is more of the same "V" treatment — the supportive and ultra-comfy Recaros with rib-hugging bolsters and thigh support, and slick but finger-printy piano black trim, Alcantara inserts, and little "V" logos litter the cabin. 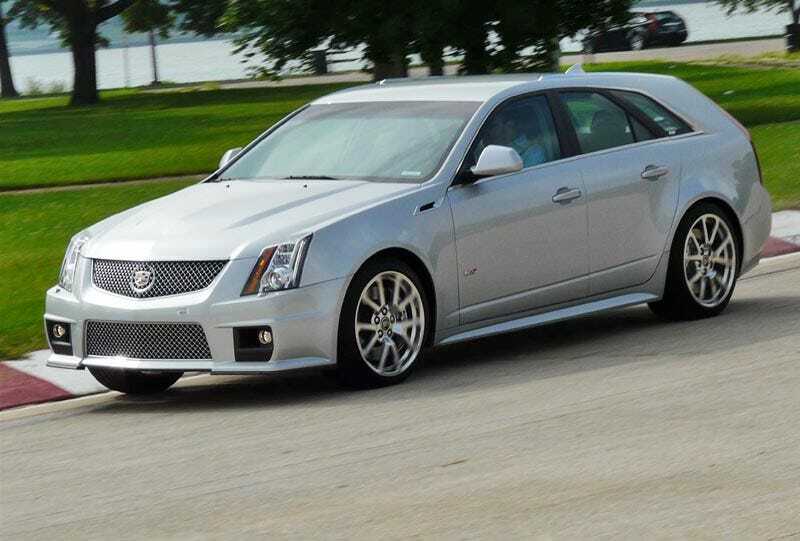 There's not much different to distinguish from the standard CTS, but that's just fine by us. The CTS-V Sportwagon is entering untested waters in the U.S. market. There simply isn't another luxury performance wagon of this caliber available, nevermind at this price point. The Mercedes E63 AMG Wagon's close, but it's down on power and priced near the triple digits, plus it's only available now by special order. The Audi RS6 has never, and will never, be offered here at its deep triple-digit price. There is no direct competition from BMW or Audi. The upcoming Acura TSX Wagon won't hold a candle to the V's performance. By definition, the CTS-V Sportwagon is a beast of burden, but one that can destroy an autocross course and effortlessly turn its 19-inch Michelin Pilot Sport PS2's into a cloud of billowing smoke. Such a vehicle is an anomaly here. Drawing a Venn diagram of people who want station wagons, people who are speed freaks, and people with the money for a $67,000-ish vehicle shows there's probably not a lot of overlapping space, but who cares? So what if the production run will be counted in the low thousands? It took GM hardly any money to build it. So what if fools in their high-riding SUV's will look down on it as a grocery getter? Does anyone really have to know the only people who'll buy this car are auto journalists? This is the thinking man's supercar, the car to buy when you know what you want and don't care what anyone else thinks. And just to be clear: It'll get groceries, it'll get the hell out of some groceries, thank you very much. This is as near to a perfect car as we're likely ever to get in the US. One which makes no compromises for performance, luxury, style and most rarely, utility. If we're beginning to sound like a broken record when it comes to talking about Cadillac CTS-V variants it's because they're all so good it's easy to run out of superlatives. By taking the already excellent CTS platform and installing a marvelous 6.2-liter supercharged V8 with 556 HP and 551 lb-ft of torque, GM's obviously baiting the enthusiasts. We'll take the bait. By having the balls to build the CTS-V Sport Wagon, Cadillac shows they're swinging for the deep seats. Now we're really itching to get some alone time on the track with this baby.